Jon Danzig's World: Do you want the Tories to put two Unions at risk? Do you want the Tories to put two Unions at risk? 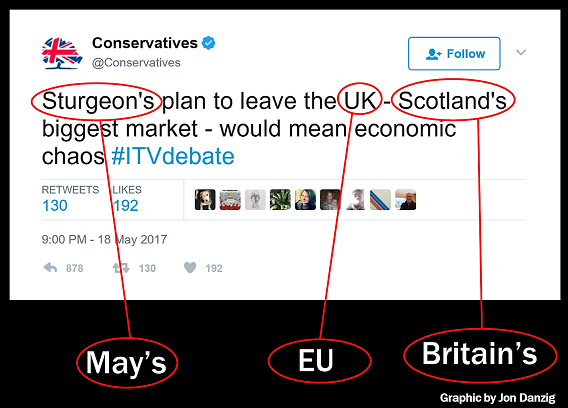 The Prime Minister doesn’t seem to get it, does she? Exactly the same arguments also apply to her plan to leave the EU as well as its Single Market - the UK’s biggest market – which would also mean economic chaos. Last March Mrs May made similar comments in a keynote speech giving all the reasons why the Union of the United Kingdom should remain intact. But yet again, all her arguments could just as easily and logically apply to keeping the Union of Europe intact. Yes, the exact same reasons apply to the European Union – reasons that Mrs May extolled before the Referendum, but abandoned after the Referendum in exchange for the trappings of high office. Yes, the strengths of the European Union are also clear – that Union is the world’s largest free trading area. Indeed, as is the European Union. Actually, the European Union is the world ‘s greatest family of nations. And its collective achievements have been huge, not least of which is the achievement of presiding over the longest period of permanent peace in our continent’s history. Doesn’t Mrs May realise that all the arguments for keeping the Union of the United Kingdom intact, are the exact same reasons for keeping the European Union intact? Undoing our Union with Europe could directly lead to the undoing of our Union of the United Kingdom. Of course, Mrs May knows that. In April last year, when she was Home Secretary, she gave one of the most powerful pro-Remain speeches of the entire referendum campaign. “..if Brexit isn’t fatal to the European Union, we might find that it is fatal to the Union with Scotland. The SNP have already said that in the event that Britain votes to leave but Scotland votes to remain in the EU, they will press for another Scottish independence referendum. "And the opinion polls show consistently that the Scottish people are more likely to be in favour of EU membership than the people of England and Wales. “If the people of Scotland are forced to choose between the United Kingdom and the European Union we do not know what the result would be. "But only a little more than eighteen months after the referendum that kept the United Kingdom together, I do not want to see the country I love at risk of dismemberment once more. "I do not want the people of Scotland to think that English Eurosceptics put their dislike of Brussels ahead of our bond with Edinburgh and Glasgow. Do you really want Theresa May as our Prime Minister, when she supports Britain's membership of the EU one month, then changes her mind the next? Are you happy for Tories to be running the country, and ruining our partnership with the European Union and its Single Market, as well as potentially our Union with Scotland? The General Election is on 8 June.